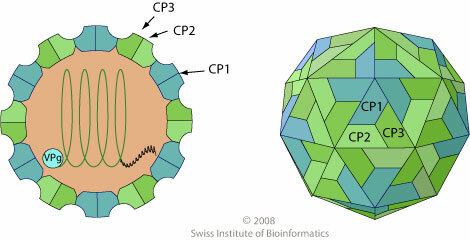 Non-enveloped, 30 nm in diameter, T=pseudo3 icosahedral capsid. Linear ssRNA(+) genome of about 12 kb. The 5' terminus has a genome-linked protein (VPg). A poly (A) tract is present at the 3'-end of the Waikavirus genus. The virion RNA is infectious and serves as both the genome and viral messenger RNA. The genome single (or major) ORF is translated into a polyprotein which is subsequently processed by virus-encoded proteases into functional products. There may be also be two small ORFs near the 3'-end. Synthesis and proteolytic cleavage of the viral polyprotein. TROPISM RTSV: vascular tissues, restricted to the phloem cells. MCDV: phloem, phloem parenchyma and bundle sheath. GEOGRAPHY RTSV: South and South-East Asia. MCDV: plant stunting and chlorotic striping of tertiary leaf veins in maize. TRANSMISSION Mechanical, vector=insects (aphids, leafhoppers). Helper protein-dependent, that protein is self-encoded and there is no need for a helper virus.